I am aging again, about tomorrow, as i do every year it seems. i got this gift certificate, or do you call it vouchier ?. 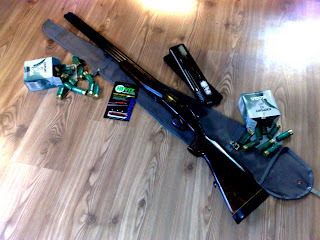 And i used it to get a box of Federal Game Shok ammo for my 22 WMR. 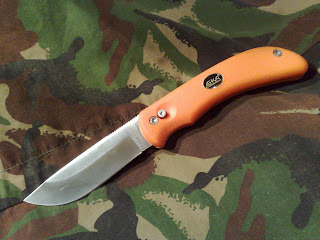 It wont be lasting long now as its hunting season for small game so i also chose this knife that i have been thinking of, and hearing that it might be well made and might serve my needs too. Its an EKA Swingblade, with bright orange handles, to help me find it after i lose it in the forest. Made from Sandvik 12c27 steel that i already have good experience of, as my Eka Super Swede pocket knife has the same steel in its blade. I dont have any field, nor hands on experience of the knife yet but i really really hope it turns out to be a decent knife for my hunting needs. 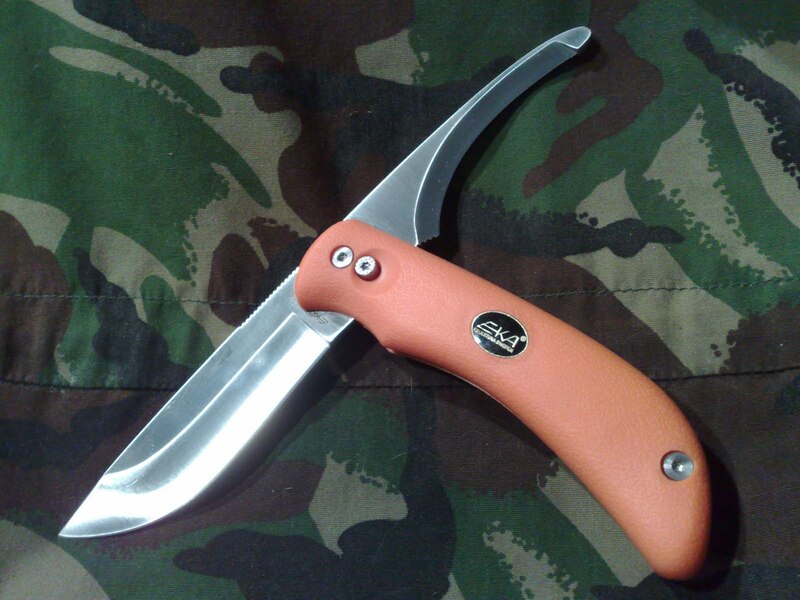 The knife blade is 10 cm long and the gut opener blade 8 cm. 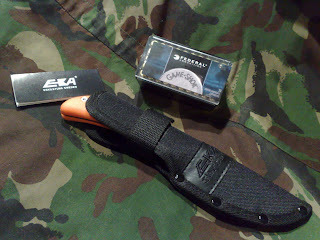 The knife comes with a plastic lined with a nylon fabric. Simple and can be washed easily. It has a good sized belt loop too. 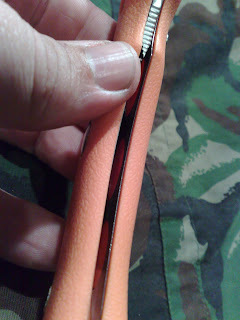 The only small downside is that the belt is secured on its sheath with a noisy and wearing piece of velcro. But thats easy to change, to me :). Steel quality is Sandvik 12C27 hardened to 57-59 HRC. 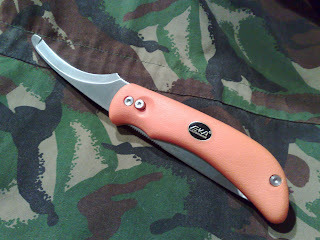 The knife has a rotating blade made from sole piece of steel. The small button locks the blade in its place. The gutting blade has its sharp edge on the opposite side than the main blade making it easy to use the knife in familiar position in your hand and open the game. 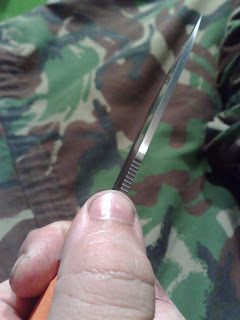 It also has a round, dull tip so it wont stick into guts or worst, pierce the guts. 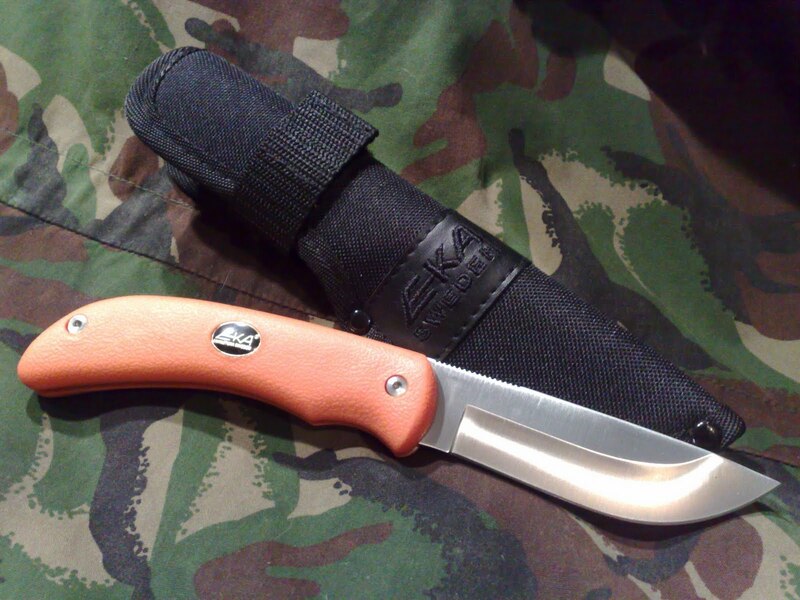 Both blades have a good, quite sharp, simple and grippy jimping on the spines. Good detail on a knife meant to be used often on bloody, slippery jobs. 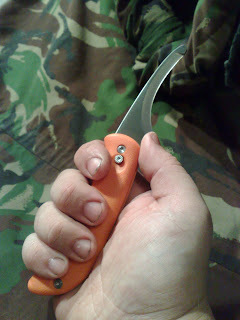 Many seem to believe that the handle is made only from rubberized plastic but its not. The handle has a good, sturdy stainless, skeletonized steel frame between the handles visible slabs. 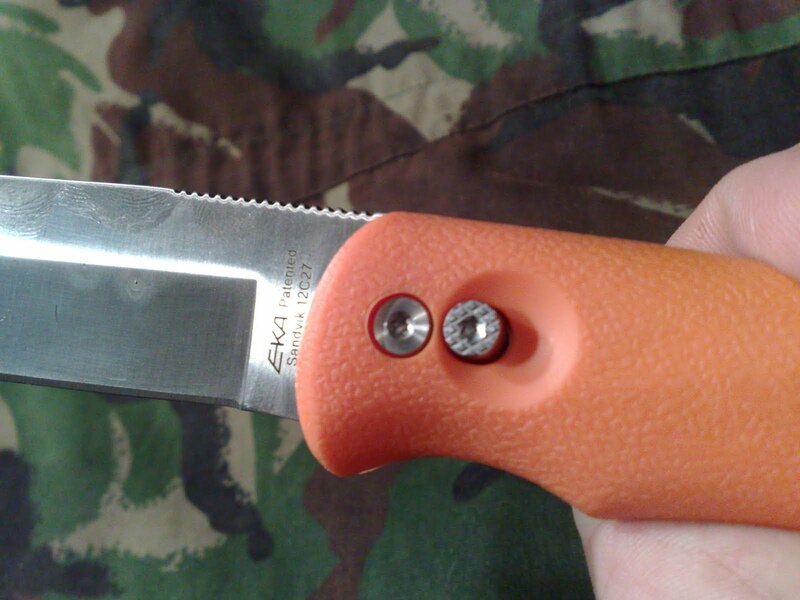 The handle is also easy to put down in parts as its assembled with quite commonly found bolts and counterpieces. 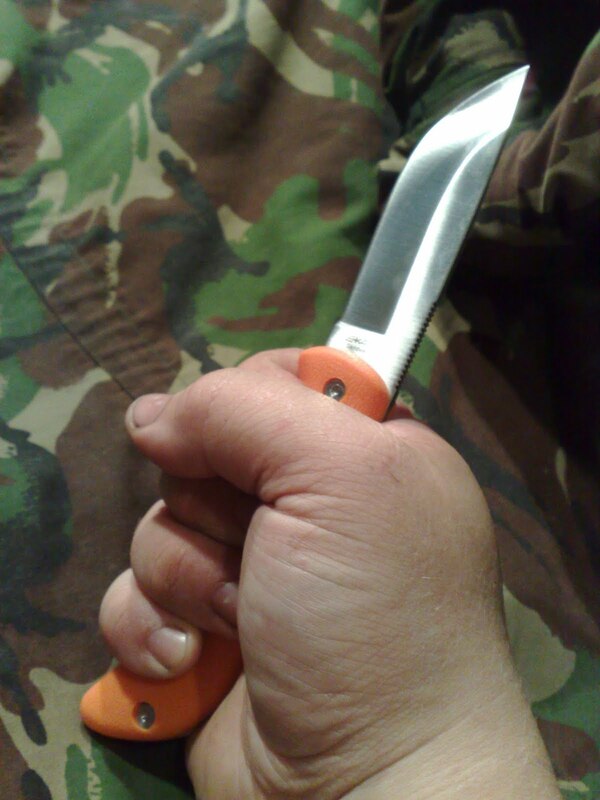 Again a good detail for knife thats to be used on game handling where its good to have a knife that you can clean and wash, well to prevent germs. Plans for the weekend, with TOZ 34. 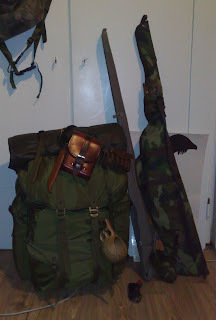 I think ill be heading to Kuru, to hunt as the seasons are starting ! Today i cleaned and checked out my "new" shotgun, TOZ-34, and put the HiViz bead on its rail,and thats about it, ill try to get a few shots fired before weekend too. Its not a hi-tech, nor a legendary outfitters shotgun but to my wallet and hand,it feels pretty good so far. Sorry about crappy pic,my phone dropped on ground yesterday and its now working well now.